Want to be a part of National American Miss, but you thought you were too old for all the fun? National American Miss is now accepting applications for girls ages 19-24!!! Do you live in a state that we do not currently hold a state event, but you are between the ages of 4 and 24? This is your chance to represent and serve your state all year long as State Royalty! National American Miss is the largest pageant in the nation for young women. We are so excited to extend an invitation to you to be a part of our program! At this time, we are not offering a program in your state for your age group. However, we hope you will be a part of our Appointed Representative Program. The girl that is selected as the State Queen will be given the opportunity to compete at the National Pageant, in Hollywood California for the National Title of NATIONAL AMERICAN MISS for her age division. It’s your chance to make memories that last a lifetime. To fill out your application, go to www.namiss.com/application. Once we receive your filled out resume, completed essays, and you have included your registration fee with your photograph, then we will call you to set up a phone interview. When the phone interview has been completed, then your entire entry will be placed in the hands of the selections committee. The selections committee will review the elements of your completed application and score each portion of the competition. Then, the new state queen will be appointed along with the four runners-ups. The winner will be appointed the title of National American Miss for your state and will attend the National Pageant during Thanksgiving week in Anaheim, California at Disneyland to compete for the National American Miss Queen’s Title. The 4 Runners-Up will be given the opportunity to represent their state as a city queen and to attend the National Pageant to compete for the National All-American Miss Queen’s Title. If you are chosen to be the state queen for your age division, then you will receive a packet of information to help you get started preparing for the National Pageant in Anaheim California over the week of Thanksgiving. One state queen from every state, in your age division will compete to win the National American Miss Title. As a state queen you will have the opportunity to travel to state pageants to visit and help out with the pageants. As visiting royalty you will become more acquainted with our program and it will help you understand what the pageant experience is really like at nationals. If you are chosen as a state queen, then you may choose to be crowned on stage at your state pageant (if there is a pageant in that state but not that age division) or at a state pageant close to your state. We want you to have the exciting opportunity to be a part of a state pageant and be crowned on stage. If you are chosen as one of the four state runners-up, then you will be given the opportunity to represent your state as a city queen and be eligible to compete in the National All-American Miss Pageant. 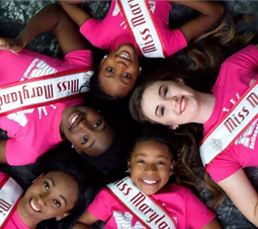 This pageant is held at the same time as the National American Miss Pageant and a new National Queen will be chosen for each age division in the National All-American Miss Pageant. The Appointed Representative Program is run completely through the NAM National Office. All applications should be mailed to the National Office and addressed with “Attn: LaKishia Edwards”. If you have any questions please call the national office. Meeting Space: 68,000 sq. ft.